Marrow and Other Stories won a 1999 Canadian Jewish Book Award, was shortlisted for the Danuta Gleed Award, and received glowing reviews. Nora Gold’s Marrow and Other Stories is a compassionate, sophisticated exposé of the inner struggles of contemporary women… The characters in these seven richly imagined stories wrestle with universal moral issues – loss of faith, infidelity, the selfishness (or duty?) of serving one’s needs, forgiveness, religious contradictions. Darkly comic, laser-sharp prose cuts to the bone; questions sharpened with guilt, anger and empathy engage… Playful language and an uncanny understanding of the relationship between the sexes rival Gold’s top-notch descriptive powers… A profoundly intelligent, wickedly humourous exploration of the language of the soul. Read “Flesh” online on Wattpad, where it is a “featured” story. The novella, “Flesh,” from Marrow and Other Stories won a Wattpad New Stories Award in 2013. Marrow and Other Stories won a Canadian Jewish Book Award (The Louis Lockshin Prize for Short Fiction), 1999. “Marrow,” the title story, won a cash-and-book prize at the Eden Mills Writing Contest (1994). “Marrow” was anthologized in Vital Signs, an anthology of promising new Canadian women writers, edited by Diane Schoemperlen. Marrow and Other Stories was shortlisted for the Danuta Gleed Award, a prize for the best first short story collection in Canada (1999). Part of the story “The Prayer” was set to Benjamin Britten’s music and read as part of the Yom Kippur service at Temple Emmanuel in Toronto (Rabbi Bielfeld), 1999. As heartwarming and delightful as Ann Tyler or Anita Brookner… Vivid and stunning allusions from our ancient literature. Extraordinarily powerful stories that take us where no Jewish women’s fiction has gone before… The reader can’t pull away…We’re touched to the bone… Terrific fiction. This is a passionate collection. The story, “Marrow,” is moving, along with others, and “Miniatures,” a clever conceit (as in a jeweler’s term), each facet different and illuminating. The stories slip in and out of Israel, in and out of resident/alien consciousness, in and out of the present and the Biblical. Quite a feat. “Only connect,” the British novelist E.M. Forster wrote inHowards End. These simple words, on the imperative of love, capture the essence of this debut collection of short stories. Some of Nora Gold’s characters are painfully isolated, by grief or disillusionment or despair. But the potential for connection – indeed, the yearning for it – underlies these seven stories like a gravitational force. There’s passion here, but also the kind of moral seriousness you don’t often find outside of philosophy texts. And talk about bravely unfashionable! Religious faith is far from being a trendy theme in contemporary fiction. Yet there are two stories dealing with characters whose spiritual beliefs… are central to their lives. Not that there’s anything preachy about the stories in Marrow… “Flesh” is a gem of a story… “The Prayer” is a tribute to the redemptive power of ritual words and religious tradition. And the power of fictional words? Several stories in Gold’s Marrow memorably bear witness to that. Every now and then a gem of a book appears on the Canadian Jewish scene that both delights and resonates with its authenticity. 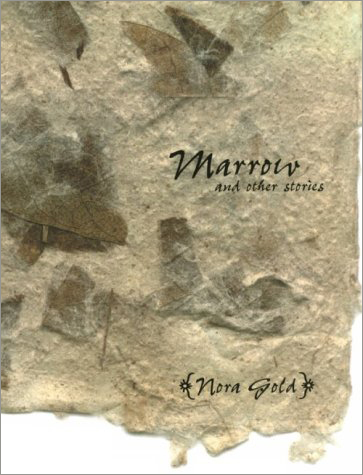 Nora Gold’s recently published Marrow and Other Stories is such a book. The body is a common metaphor for discussing fiction. Yet, while we tend to focus on a narrative’s “flesh” and “skeleton,” we rarely consider what goes on inside the bones. This is the fresh perspective taken by Nora Gold in her excellent first short-story collection. It may seem ridiculous to compare fiction and bone marrow, but Gold’s writing about women and their losses encourages us to do so. She urges us to look for deeper significance – not by looking outward toward universality, but by looking inward at the way we have constructed ourselves. At its most fundamental, this dissection implicates the language which we use to understand ourselves and to communicate, and in which Gold writes… asking us to reconsider the binary of right and wrong that language sets up. While these stories may depict profound sorrows, they radiate vitality… Dazzling characterization…Marrow and Other Stories is a remarkable achievement. Gold is a skilful sorcerer who ventures fearlessly into dangerous territory, and embraces her characters with compassion and insight. A remarkable collection of seven powerful short stories… Gold brilliantly catches the loves, the losses and the games in the lives of Jewish women. The stories I like best are whispers in my ear… Chekhov, Grace Paley, Isaac Singer, Elizabeth Bowen are all whisperers… Nora Gold is a whisperer, too. Gold explores what it is that makes us essentially human… She creates characters who emerge from the text to take our hands and inhabit our lives. Nora Gold is a master of the ambiguities of human behaviour. Nora Gold’s great gift in this auspicious first collection is to take us deep and mesmerizingly into interior spaces that have never before been explored – the transfiguring trance of a woman, a non-believer, chanting the Hebrew prayers; the hypnotized ardour of a clever Jewish girl who finds a dangerous rabbinic mentor; the oceanic secret life of a female hermit… Gold’s eye for the detail and complexity of women’s lives is sharp, but her touch with her characters, male and female, is generously humane. In this powerful debut collection, Nora Gold grapples with the themes which most compel us all: loss, loneliness, betrayal, fear, and faith. With unflinching honesty and thought-provoking insight, she leads us repeatedly to the pivotal point where all seems lost and then digs deeper to discover what remains. “Flesh” is a richly atmospheric and wonderfully readable novella, a remarkable debut for Nora Gold. One-hour interview with Dr. Howard Adelman on his show, “Our Jewish World” (CTS), aired February 7, 2010. In this interview, Dr. Gold discusses Fields of Exile, the novel she was working on then, and its relationship to her pro-Israel activism. One-hour interview with Dr. Rachael Turkienicz on her show, “Uncommon Ground” (CTS), which aired twice (November 29 and December 3, 2008). In this interview, Dr. Gold discusses her personal background, her writing, her activism, and her spiritual life, and the relationships between all of these. Half-hour interview with Sara Horowitz on “Israel Today” (Vision), May 2002, on being a Jewish writer. Half-hour interview with Elly Juliet on “Imprint” (TVO), February 1999, on writing and on Marrow and Other Stories. Books in Canada, May 1999, pp. 36-37, Alana Wilcox. Bridges, “The Search for Meaning and Peace: Crossing Boundaries in Savyon Liebrecht and Nora Gold,” Vol. 8, Nos. 1-2, pp. 158-161, Esther Fuchs. Jewish Tribune, “Nora Gold: The Jewish Alice Munro,” March 14, 2005, Doris Strub Epstein. Literary Review of Canada, “Darkness and Light,” April 1999, Vol. 7, No. 7, pp. 23-25, Ruth Panofsky. Globe & Mail, “Risk-taking Stories Probe Soul of Love,” June 20, 1998, p. D16, Thea Caplan. Montreal Gazette, “Heart of Gold,” August 29, 1998, Monique Polak. Lilith, Fall 1999, p. 39, Susan Weidman Schneider. Hadassah Magazine, Fall 1999, Gloria Goldreich. Toronto Star, “The Need to Really Connect: Nora Gold’s Debut Ponders the Role of Faith,” August 22, 1998, p. M14, Barbara Carey. Toronto Star (Feature Article), “In Search of Secrets,” August 16, 1998, p. 1 of Section C (People), Leslie Scrivener. The Jewish Advocate (Boston), “Nora Gold Offers Portraits of Passionate Jewish Women,” Jan. 15-21, 1999, Sylvia Rothchild. New Brunswick Telegraph, “Flesh and Bones,” October 3, 1998, Trudy Kelly Forsythe. Canadian Jewish News, “Nora Gold Shines in Longer Works,” October 28, 1999, p. 40, Bill Gladstone. Na’amat Woman, Fall 1999, Vol. 14, No. 4, p. 25, Esther Cohen. Nashim: A Journal of Jewish Women’s Studies & Gender Issues, Spring/Summer 2000, No. 3, pp. 267-272, Rochelle Furstenberg. Hamilton Jewish News, Sept. 1998, p. 18, Wendy Schneider. Id Magazine, Sept. 17, 1998, Christine Mathieson. Dr. Gold is an engaging, dynamic speaker whose talks have been enjoyed by many different kinds of groups and organizations. To invite Dr. Gold for a talk or program, please contact The Jewish Speakers Bureau.